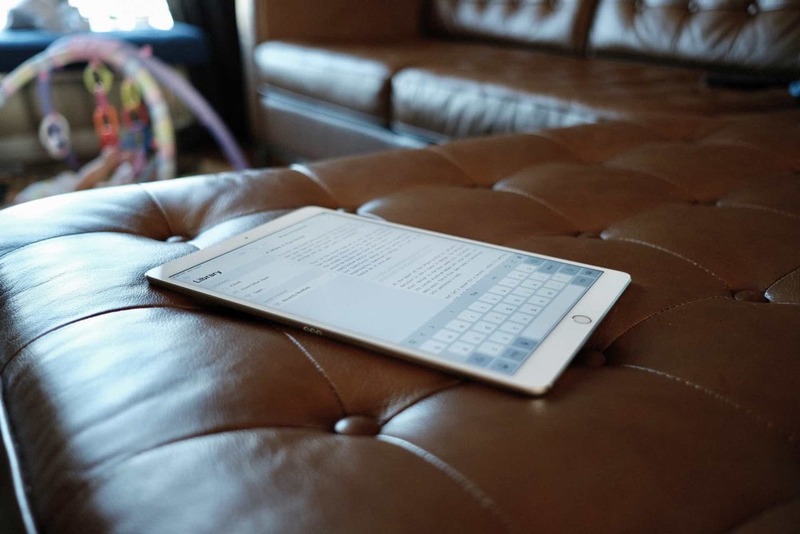 iA Writer is our favorite Markdown editor for iOS. 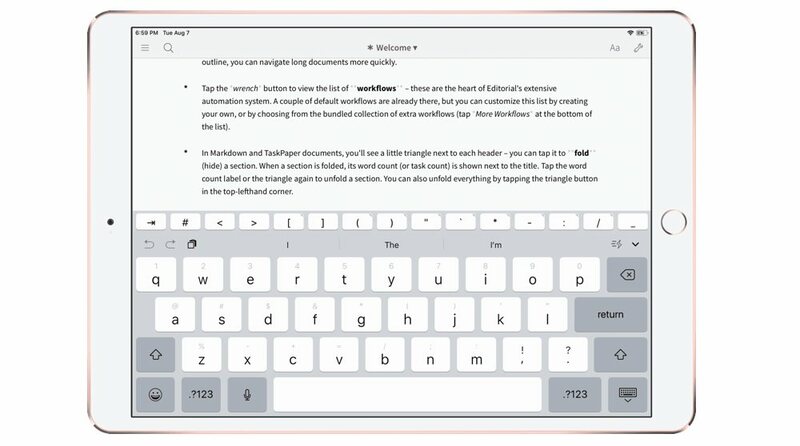 Aside from being a beautiful and focused writing tool, iA Writer’s unique keyboard shelf design and abundance of formatting shortcuts make writing Markdown easy and intuitive on iOS. Initially released by Daring Fireball’s John Gruber in March 2004, Markdown is a plain text-based markup language for HTML. Using a simple and easy-to-learn syntax based on plain text, Markdown lets you produce valid HTML without having to manually type any of the language’s complex system of tags. Markdown is a “text-to-HTML conversion tool for web writers”, and, in recent years, has spurred the creation of enhanced variants (such as the popular MultiMarkdown) as well as native apps that integrate with it. There are hundreds of iOS text editors that use plain text and Markdown to simplify web writing on the iPhone. 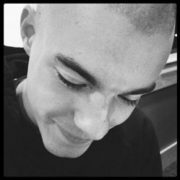 Competition is fierce and new apps that rely on Markdown to convert plain text to HTML are announced on a weekly basis. There are several factors that have contributed to Markdown’s rise to the de facto standard for web writers who don’t want to learn HTML: plain text is a portable format, which allows users to move their files around and try multiple apps without losing their data; portable files work well with syncing systems like Dropbox and iCloud; plain text files are lightweight, which make them ideal for mobile syncing on cellular data and note-taking apps that are meant for quick annotations and short bits of text. Markdown is completely open-source, which has enabled thousands of programmers and developers to use Gruber’s syntax (or an alternate version) in their apps. 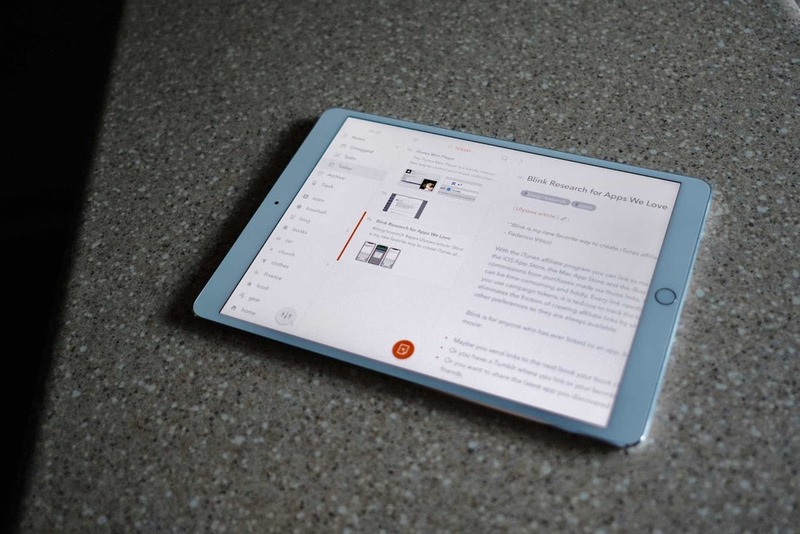 What’s the distinction between the best Markdown editor and the best note-taking app? Couldn’t having a great Markdown editor be a component of what goes into our choice for the best note-taking app? 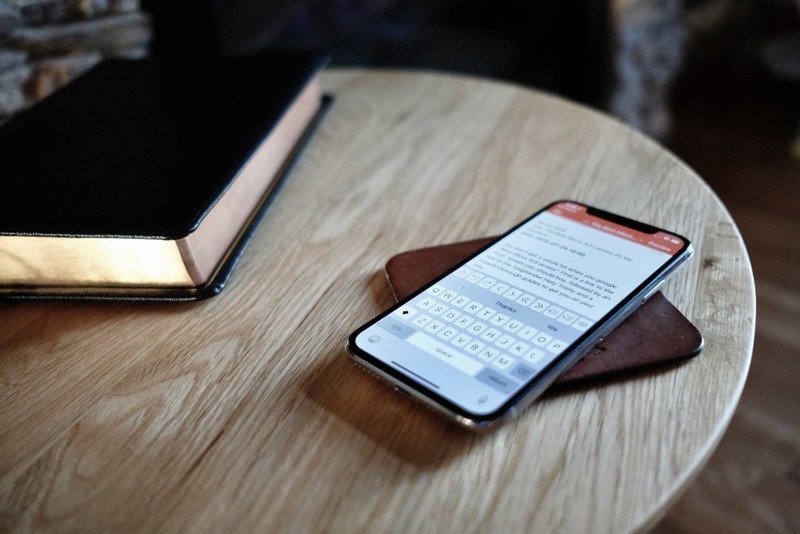 It could, and it’s certainly something we considered when writing our review of the best note-taking apps for iOS. 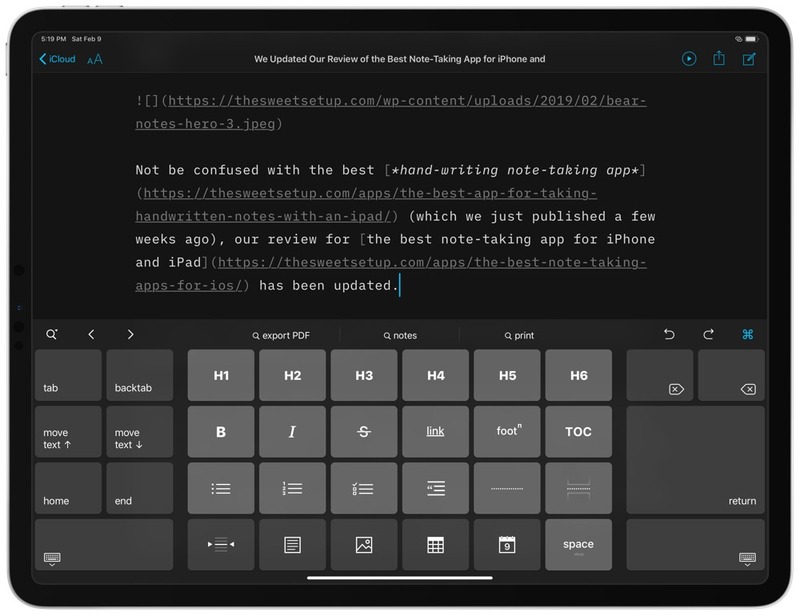 However, for people who want to write exclusively in Markdown, what app is going to give them the best experience — especially on the go? The apps we discuss today may have similar features, but ultimately they’re designed to be great Markdown editors first, without worrying about where you may choose to store all your notes. What makes a good Markdown editor? Realtime preview of your Markdown syntax: Markdown is designed to be written in plain text, but we like apps that perform inline italicizing, bolding, or decorating of certain Markdown-related patterns. This inline formatting not only gives you visual benefit of a rich-text editor, but it also lets you easily correct any syntax-related errors. 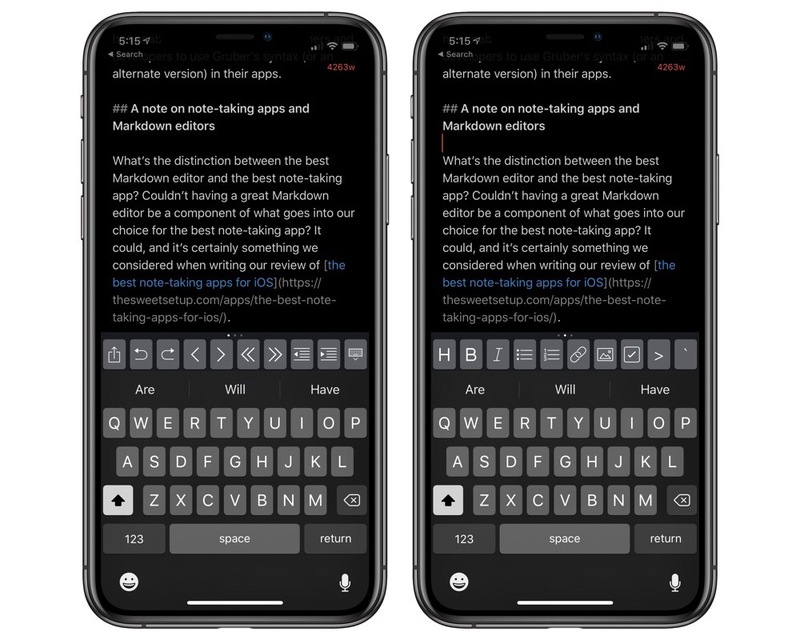 Fast and accessible shortcuts for common Markdown formatting options: Particularly on the iPhone, accessing some of the special characters required by Markdown can be frustrating because you have to constantly toggle between the alphanumeric keyboard and the special characters keyboard. Well-designed Markdown editors will alleviate this pain by providing one-tap shortcuts for inserting links, italicizing text, or indenting a code block. A variety of export options: Markdown is much easier to write than HTML, but you still might want HTML to be the final format for your words. A good editor is going to make it easy to take your content and quickly export to rich text, PDFs, or web pages. 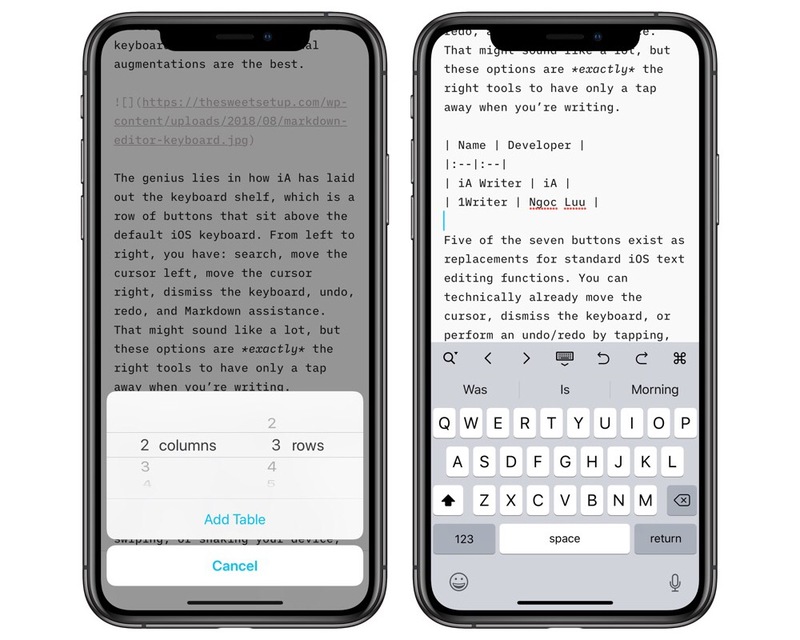 iA Writer is a sleek and minimal writing environment and the best Markdown editor we’ve found for iOS. To describe it in a word, you’d quickly arrive at “focus.” It excels at showing you the tools and buttons you need, and nothing that you don’t. 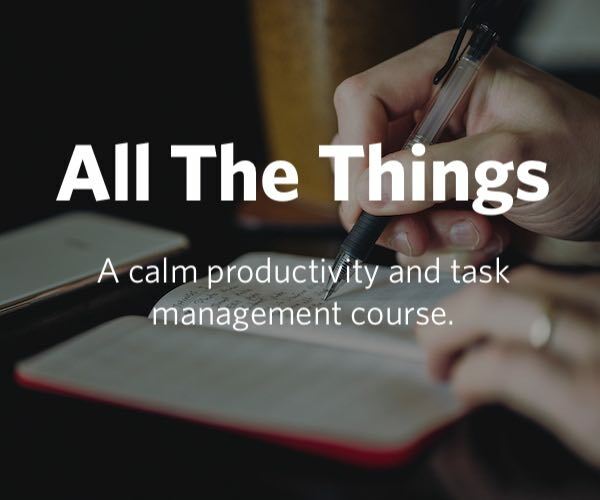 This lets you pay attention to what you’re writing and not what non-writing things you can do. 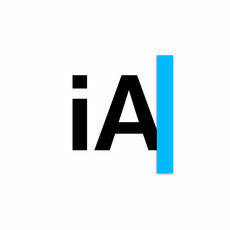 That said, there’s a lot iA Writer can do, and it’s packaged in a wonderfully simple, approachable design. Quick Search — A good test for apps aimed at writers is to count the number of times the user is forced to take their hands off the keyboard in order to accomplish a task. In iA Writer, the design and development team has created a unique approach to quickly getting to anywhere in the app called Quick Search. Tapping on the search icon (which is available from nearly every view in the app) will launch a small popup where you can begin typing to filter through both files and actions. This means you can start typing n to return Night Mode, and then hit enter to activate it. Quick Search works for terms like “export” to show all available export formats, or for regular file searching where the app returns any files that match your keywords. 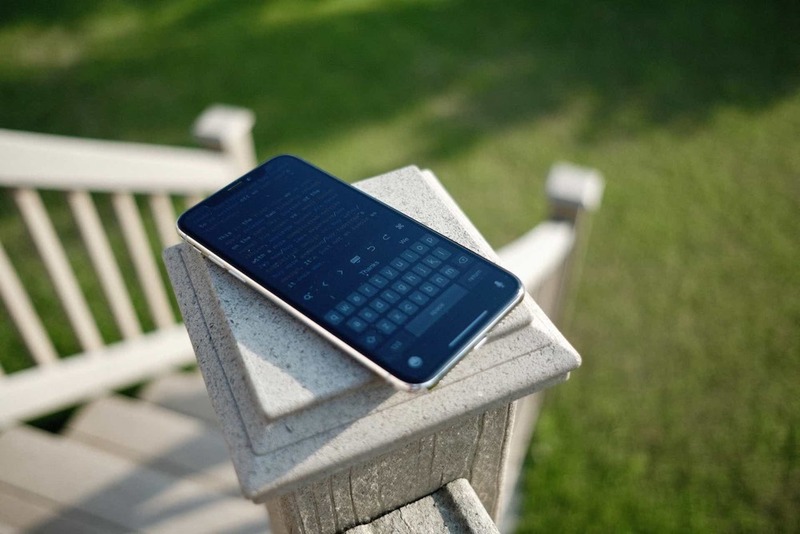 It’s a fast and innovative way to jump around the app without needing to dismiss the keyboard. Quick Preview — If you’d rather see your document as it would look rendered by Markdown, iA Writer let’s you quickly activate a fullscreen preview. The transition between editor and preview is satisfyingly fast, and I appreciate that you don’t need to export your content just to get an idea of what the final product will look like. Focus Mode — One of iA Writer’s hallmark features at launch, Focus Mode blurs everything except the current sentence or paragraph. You’ll either love it or hate it, but I’ve grown to appreciate the focus as it helps me keep writing instead of constantly stopping to make changes. Lack of display options — It might sound odd to celebrate a lack of font options or display themes, but I think it speaks to iA Writer’s approach to focus. Instead of allowing you to fiddle with the font, iA Writer only has two typeface options: Monospace or Duospace, which to most people will look practically the same. You also only have a light or dark theme, because that’s all anyone really needs. 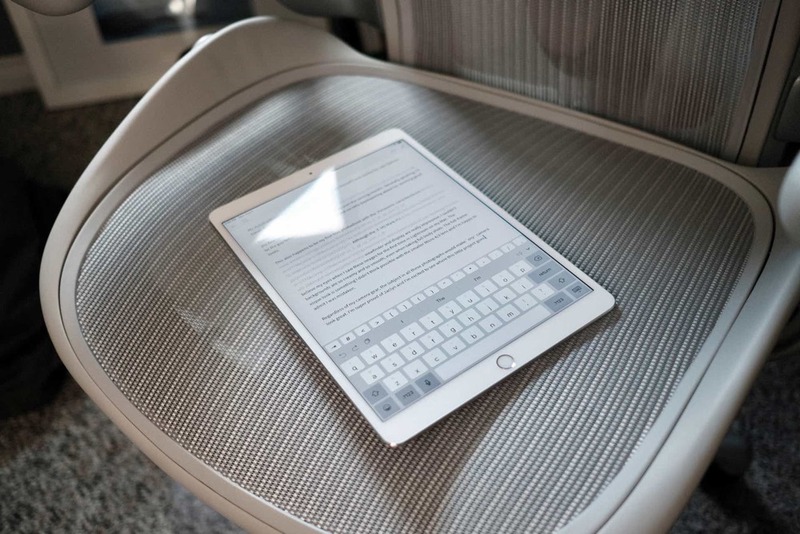 Those of us who like to tinker with their setups and writing environments might find iA Writer restrictive, but the lack of options has a way of really forcing you to get to the writing, which is why you opened the app to begin with. Realtime Markdown syntax highlighting means that if you wrap a word in asterisks to indicate italics, iA Writer will actually display that word italicized. Additionally, for things like Markdown links or bullet lists, iA Writer will actually dim the extra special characters so that they don’t compete as much visually with the words themselves. Even though Markdown was designed to be read as plain text, many Markdown editors include some form of syntax highlighting to help the writer read their document, and iA Writer’s implementation does just that. The focal point of any writing tool is the keyboard, but iA Writer takes it one step further with a custom keyboard “shelf.” This shelf is an extra row of icons that sits right above the standard iOS keyboard and gives you one-tap access to many common iOS- and Markdown-related text operations. Of all the Markdown editors I’ve tested, iA Writer’s keyboard shelf and additional augmentations are the best. The genius lies in how iA has laid out the keyboard shelf, which is a row of buttons that sit above the default iOS keyboard. From left to right, you have: search, move the cursor left, move the cursor right, dismiss the keyboard, undo, redo, and Markdown assistance. That might sound like a lot, but these options are exactly the right tools to have only a tap away when you’re writing. Five of the seven buttons exist as replacements for standard iOS text editing functions. You can technically already move the cursor, dismiss the keyboard, or perform an undo/redo by tapping, swiping, or shaking your device; however, each of these actions waste time waiting on animations and distract you from writing. 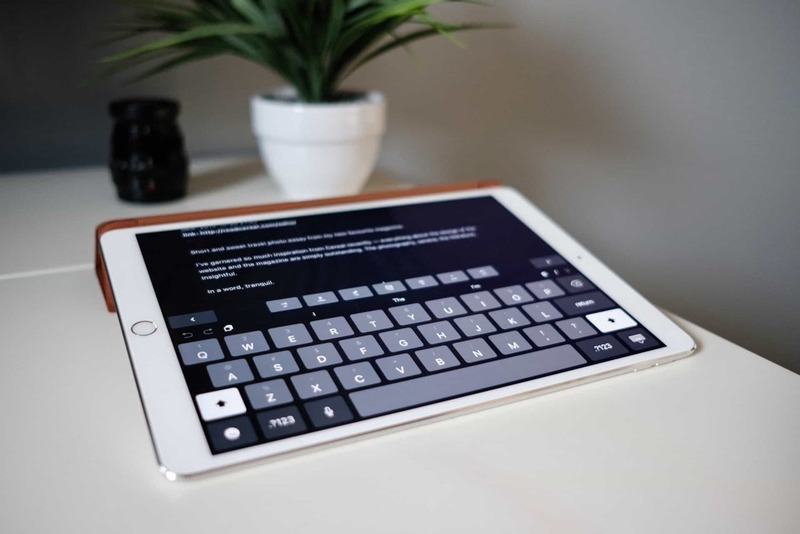 iA Writer’s keyboard shelf allows you to completely skip the iOS animations or prompts and get right to what you wanted to accomplish. 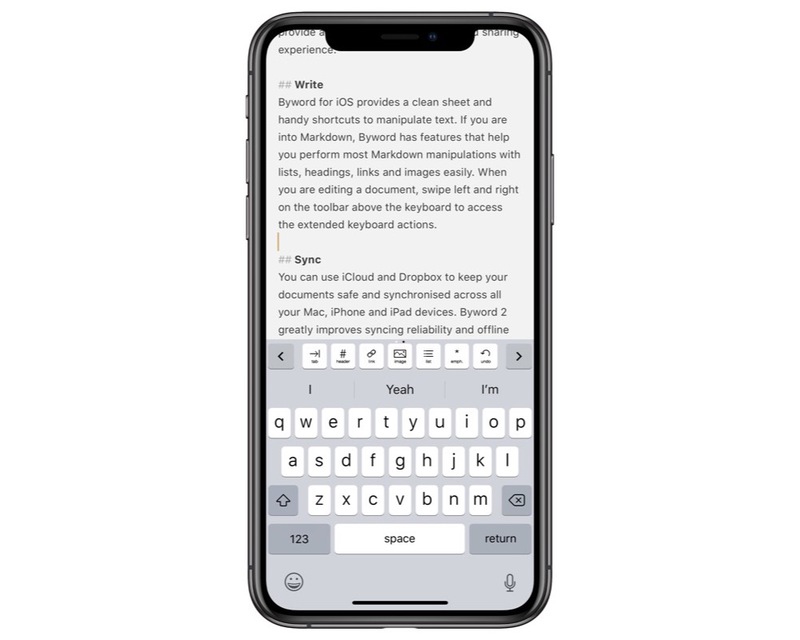 These shortcuts go a long way towards making writing on iOS less of a pain, and they eliminate many common editing actions that would usually pull the writer out of their flow. Ultimately, we’ve selected iA Writer as our favorite Markdown editor for iOS because of how easy it makes writing in Markdown. 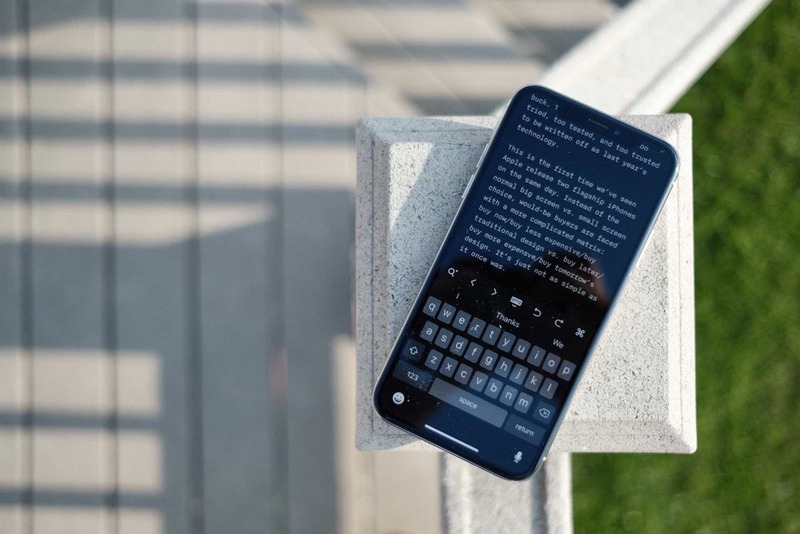 But in order to understand the challenges in writing Markdown on a mobile devices, it helps to first understand what’s difficult about composing Markdown while on the go. Markdown relies on characters that aren’t always convenient to access on iOS. Making lists, italicizing words, or inserting links all require some combination of special characters. If you’re using a full-sized keyboard, accessing an open bracket ([) or making a 15-point bullet list with asterisks (*) isn’t difficult, but if you’re on the iPhone, repeatedly bringing up the secondary special characters keyboard view is soul-crushingly slow. Because of this, most Markdown editors ship with some form of Markdown shortcuts, usually represented as one-touch implementations of common Markdown formatting options. 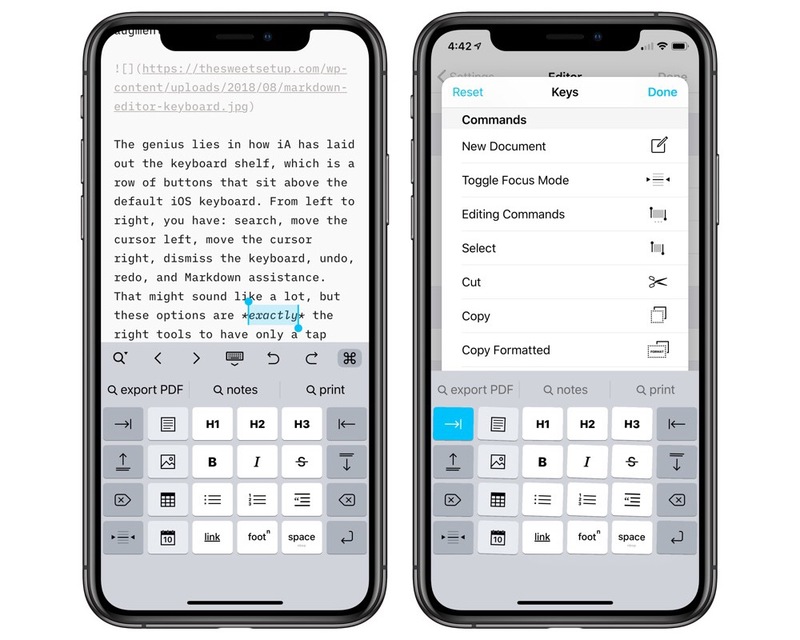 In iA Writer, this screen of tools is revealed by tapping on the rightmost keyboard shelf button, and it perfectly fits into the space the iOS keyboard was previously occupying. This will reveal a pane of additional buttons designed to speed up using almost every available Markdown formatting option. Tapping on the Bold icon will wrap your cursor in two matching sets of **, which tells Markdown the enclosed text should be bold. 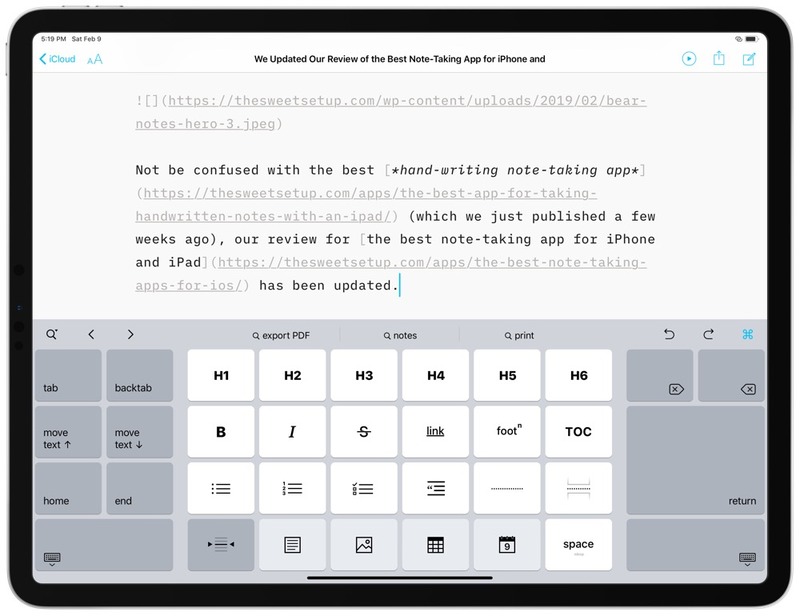 Writing that out by hand on an iPhone is tedious, but with iA Writer all you have to do is tap on the Link button, and the editor inserts your cursor between a pair of square brackets while automatically filling the round brackets with any link you might have in your clipboard. Inserting the current date: Display a date picker (preset to today’s date), and then insert that into your text. Indent in/out: Something you’d usually have to do by tapping the space or backspace key multiple times. Delete and backspace: Being able to remove characters on either side of the cursor is a really useful shortcut to have available. Table creation: You will generally get one of two responses from a Markdown user if you ever ask them to create a table: surprise such creation was even possible, or instantaneous sadness. Although Markdown excels at making web content easier to write, the complexity of HTML tables means that the Markdown syntax is still frustratingly complex. Tables simply weren’t designed in an environment where every cell can have a unique width. You either spend extraneous time tediously lining up the various pipes and hypes of the Markdown table syntax to maintain readability, or you throw caution to the wind and resign to catching any issues in the Markdown preview. iA Writer isn’t able to escape all of the problems that creating a table in plain text brings, but it does attempt to reduce the pain. Tapping on the table shortcut button will open up a prompt asking you to define how many columns and rows you’d like, and then iA Writer injects the necessary text to make it so. Editing the resulting table is still time consuming, but so long as you have your table content already in mind, it’s manageable. Content blocks: iA Writer allows you to include other documents or images in your content through something called Content Blocks. These are best thought of as placeholders that don’t junk up your current document. The default set of Markdown shortcuts are perfectly fine for most users. However, if you find yourself wanting to have shortcuts for to-do lists, page breaks, or a table of contents generator, you can. iA Writer allows you to customize the 6×4 grid of icons with whatever you want from their Markdown/Content/Commands/Punctuation library. To begin customizing, tap and hold on any of the shortcut icons. The library of options will present itself, and each shortcut icon will begin wiggling around, much like app icons do on the home screen when you’re moving them around. If there’s one criticism to level against iA Writer’s implementation of Markdown shortcuts, it’s that the pane of shortcuts is hidden behind a tap of the rightmost keyboard shelf icon. However, because of the deep customization offered and the general spacial usability offered by a 6×4 grid view, we feel that the extra tap is a reasonable design tradeoff. The final requirement of a good Markdown editor is a bevy of export options, and iA Writer has plenty. If you’re using iA Writer primarily as a place to draft blog posts, you’ll be happy to see that you can directly export your content to a Medium or WordPress account right from the editor. iA Writer won’t handle a lot of the more advanced things you can do from a web browser, but it does allow for a seamless handoff from your phone to your blog. For every other export need, you can quickly convert and export your Markdown into PDF, Microsoft Word, or HTML. You also have control over the style of the exported documents through iA Writer’s built-in templates. The preinstalled templates are simple and respectable enough for most situations, but you can also create your own template based on the provided example source code. 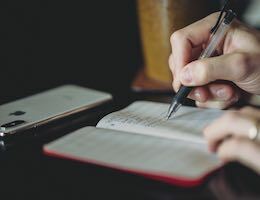 Regardless whether you’re writing for a blog, putting together a business plan proposal, or journaling your memoirs, iA Writer lets you do all the writing in Markdown without limiting your final destination format. iA Writer has adopted the “open-in place” features found in an increasing number of power user apps. Known as “Library Locations” in iA Writer, the app allows you open any directory within the Files app — be it any folder from iCloud Drive, directory from a different app that has an “open-in place” feature, or repository in an app like Working Copy — and make changes to files without having to directly import the file into iA Writer or having to duplicate the file in iA Writer. This becomes a little complex, admittedly, but the power of iA’s “open-in place” feature will be welcome for more sophisticated users. These Library Locations allows teams to make changes to shared files in a GitHub or Bitbucket repository all within their text editor of choice. For collaboration, features like “open-in place” help push the iPad closer and closer to the Mac. As we mentioned in the beginning, there are a lot of great Markdown editors these days. We think iA Writer is the best you can get, but here are a few others that are worth checking out. 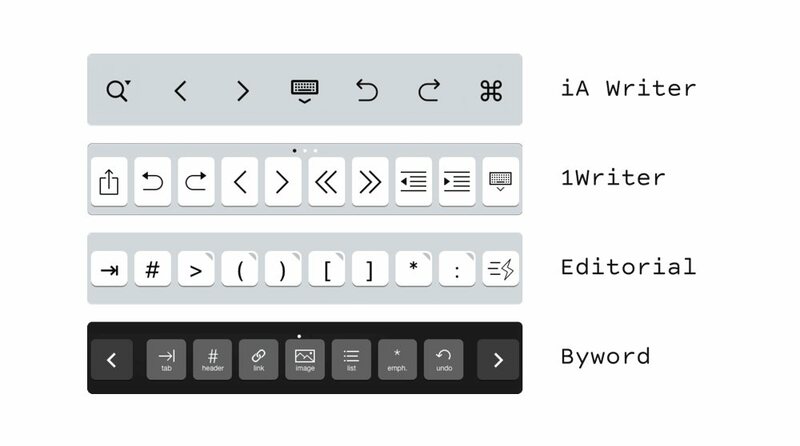 As a Markdown editor, I find 1Writer less focused than iA Writer, and I prefer the way iA Writer has designed their Markdown shortcuts keyboard pane. Much like iA Writer, 1Writer allows you to preview what the entire document will look like once exported with a single tap. With 1Writer however, certain elements of the previewed document are interactive. For example, if you’re previewing a Markdown document that has to-dos in it, you can actually tap on each checkboxes to complete the item. Going back to the Markdown source will show that the - [ ] is now - [x]. It’s a small thing, but convenient to have for certain workflows. 1Writer also supports a variety of export options, including PDF, HTML, and formatted text. There aren’t any customizable themes, so you’re getting somewhat plain looking documents, but they’re available nonetheless. At one point in time, Byword was our top pick for favorite Markdown editor. But as the syntax around Markdown has slowly evolved, Byword hasn’t take many steps to make the writing process easier. It’s still a fine app, and it’s one of the few that offers direct publishing to a wide range of services, but when it comes to actually writing Markdown on the go, Byword shows its age. Compared to 1Writer or iA Writer, Byword’s keyboard shelf and Markdown shortcuts are limited. There’s no swiping or tapping to reveal more shortcuts (although you can swipe to the right to reveal the current word count), so if you need options beyond the standard tab, header, link, image, list, and emphasis, then you’re out of luck. Granted, those aforementioned shortcuts can get most people pretty far, but it’s disappointing to see Byword not keep up with more modern Markdown syntax support. Although Byword falls short in Markdown shortcuts, it redeems itself in publishing options. 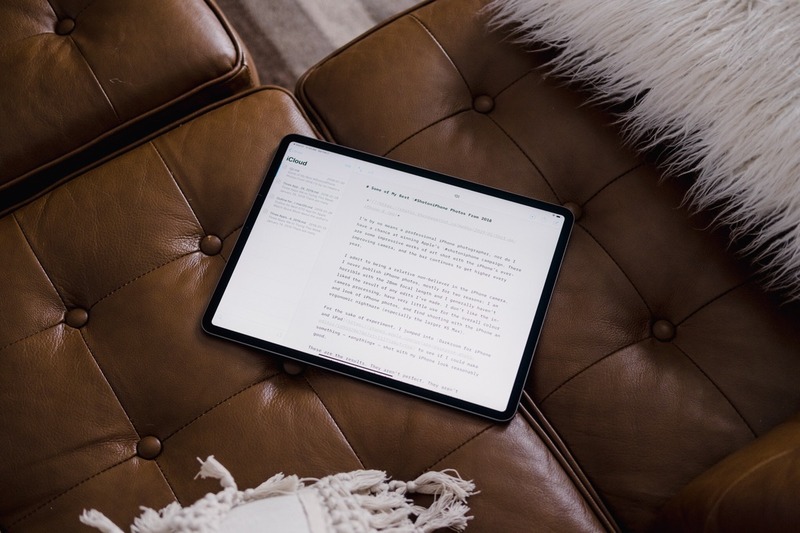 Whereas 1Writer or iA Writer only supported one or two services, Byword supports direct publishing to Medium, WordPress, Tumblr, Blogger, or Evernote. Additionally, Byword does a good job at making all your different export destinations and formats available as a single list, without the need to tap through prompts or fallback to the iOS Share Sheet. Byword doesn’t support themes like iA Writer for exported documents, so prepare for every PDF and HTML document to look the same. One particularly odd design decision worth mentioning, if only because I had a hard time finding it during this review: Byword has both Settings and Preferences screens, but they’re at opposite ends of the app UI. The Settings screen is accessible from the main page of the app, but that’s only to store your Dropbox settings and document sorting options. To access things like font sizes, and the app theme, you have to tap on a “•••” button that’s only available when actively editing a document. It’s not terribly hidden, but why not just have them both available from the same place? 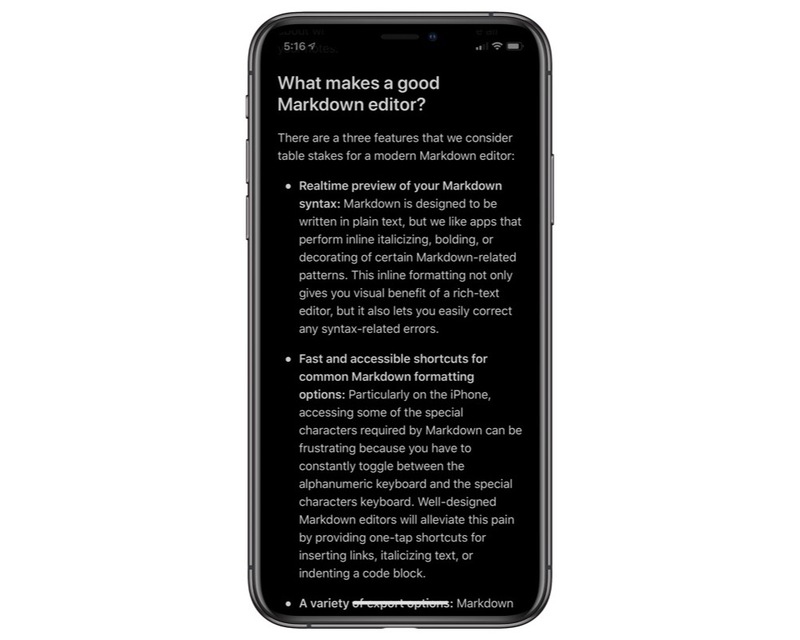 Editorial may be one of the more powerful text editors on the App Store, but we’re only looking at how it fairs as a Markdown editor based on syntax highlighting, Markdown shortcuts, and export options. Editorial’s syntax highlighting is excellent. It covers most common Markdown grammar, while providing the inline styling of italics, links, and emphasis that we’ve come to expect. Editorial has a similar keyboard shelf approach like the one found in 1Writer or Byword, save for two differences: the keyboard shelf doesn’t scroll, which helps with the spatial muscle memory, and a majority of the buttons on the shelf can be long pressed to reveal additional functionality. Unfortunately, while Editorial provides a powerful Markdown writing experience, it doesn’t offer nearly the same breadth of built-in export options as some of our other picks. Out of the box, Editorial only allows you to convert your Markdown to HTML. However, if you’re willing to go browsing the Editorial workflow directory, you can find a bevy of export options created by other Editorial users. A cursory dig revealed options to export to PDF, Microsoft Word, and a variety of other popular formats. We wish Editorial had more options out of the box, but the workflow directory provides adequate export flexibility for some manual hassle. Another issue with Editorial is the lack of updates over the past several years. While we love the app, the lack of updates doesn’t foster confidence in continued development, especially since (as of this update) it still does not include support for the latest 2018 iPad Pro models. 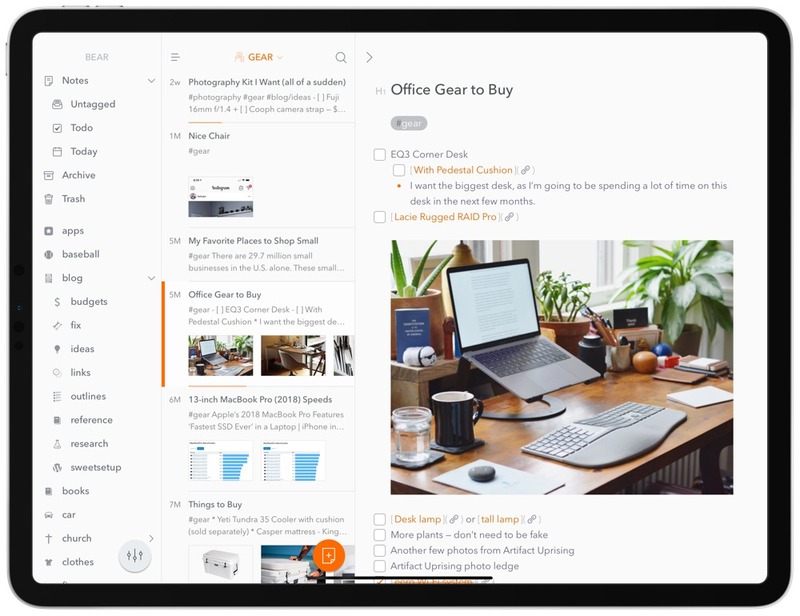 Bear is a perfect example of an app that we think is better suited as a note-taking app, and it’s our favorite note-taking app for a reason. Bear handles Markdown pretty well — and even handles Multi-Markdown for anyone looking for more in-depth Markdown writing — and many folks will likely use Bear for its export options, Markdown shortcuts, and previewing your Markdown syntax. However, Bear handles Markdown somewhat differently than how you would expect a standard Markdown editor to behave. There are only three header options in Bear, so increasingly organized work is generally better handled in different notes instead of one large note with multiple headers. Links are stored “behind” text rather than inline, so it’s somewhat difficult to view your raw Markdown syntax as you’re writing. And there aren’t any options to create Markdown tables or to get into the deeper parts of Markdown, like creating footnotes. Overall, we think Bear is better suited for note-taking purposes. 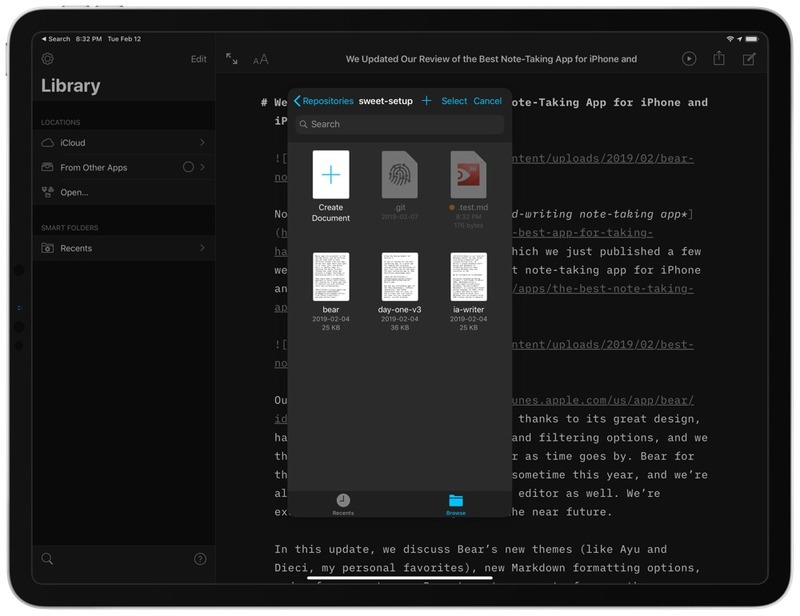 Storing all sorts of images, PDFs, files, and text in a Bear note is a far better experience than trying to do the same thing inside iA Writer, but previewing your Markdown syntax inside iA Writer is a faster, more enjoyable experience. There’s no shortage of Markdown editors out there, but we feel that iA Writer is a cut above the rest. With its focused writing environment, superb Markdown syntax highlighting, and wide range of export options, iA Writer lets you write comfortably in Markdown and then send your text anywhere.